Most of us don't set out to have tens of thousands of readers when we start blogging, but having an audience of SOME size is always nice. You work hard to write the posts, edit pictures and make sure it all shows up on the right day. It's fun to have others interacting with you by reading and commenting on your hard work. Below are five great articles to help you grow your blog, whether that's ten people or thousands. 1. How to Grow Your Blog Blogging Tips by Ginger Snap Crafts. 2. 5 Ways to Promote Your Blog for Free by Little Pink Strawberries. 3. How to Grow Your Blog While Having Fun and Staying True to Yourself by Modern Mrs. Darcy. 4. 10 Point Check List to Grow Your Blog by Ragan. 5. On How to Grow Your Blog by Jenny Komenda Interiors. 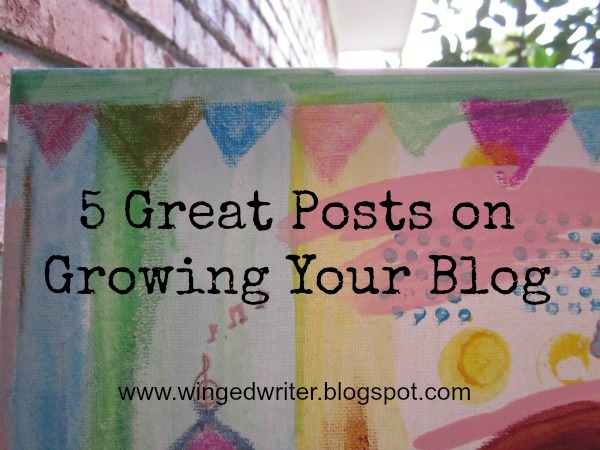 In case you'd like to read more blogging tips, here are 5 Great Posts on Blogging, and 5 Great Posts on Blog Photos. Wow. Catherine this is right on time. I was just talking to someone this weekend about wanting to grow my blog. I have bookmarked this...thank you for sharing it my friendly friend! And you ARE following the advice out there because I see you are GROWING! Way to go Catherine! Thanks so much for the mention! I enjoyed browsing through these other links, too. Great roundup! Thank you! I'm very much looking forward to reading all of those. Thanks, Catherine. These are great!